New year, new petticoat. Yep, I’m still me. Amid the holiday rush, I managed to find a few hours each day to “zen out” on handsewing. 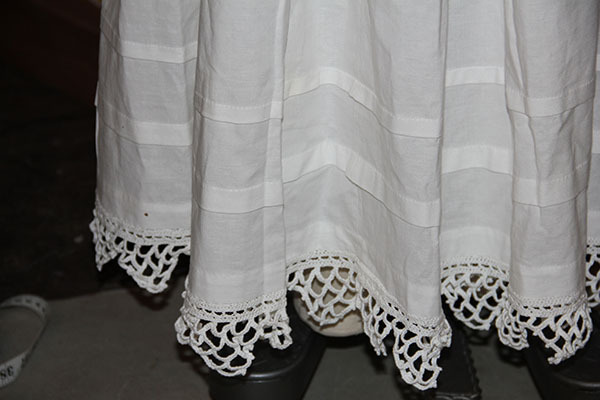 The result, a long overdue petticoat for a swath of 1850s-era “guipure” crochet edging I finished more than a year ago. Why now, you ask? What exactly motivated me to finally get this done? 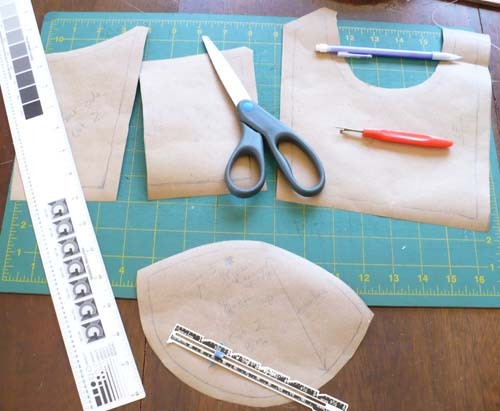 It was the Historical Sew Fortnightly, organized by The Dreamstress, who is one of my very favorite bloggers even though I’ve never met her (I always feel a bit uneasy reading the blogs of people I don’t actually know — sort of like I am stalking them). Anyways, the idea is that participants are challenged to sew an historical (pre-1938) garment every two weeks for the next year — 26 in all. Each fortnight has a theme around which to organize your project. And best of all, there’s a bustling Facebook group to share research, inspiration, and lots of delicious pictures of the completed projects! This petticoat is my contribution for challenge #0, the pre-challenge. It’s title was “Starting Simple.” Make something fairly easy, and/or something that you’ve made before. 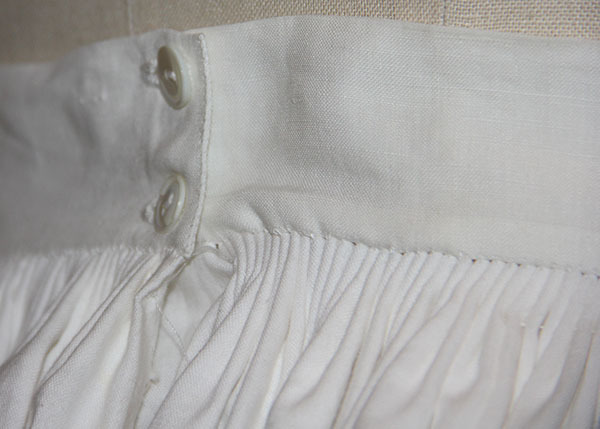 It’s a basic mid-19th century style top-layer petticoat. 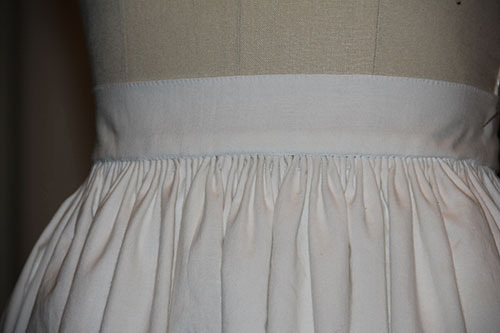 I used three breadths of 45 inch cotton, sewn up the selvedges and cartridge pleated to a buttoned waistband. 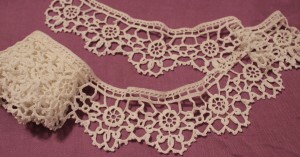 Based on this gorgeous example from The Metropolitan Museum, I decided to include 6 tucks above the edging. How historically accurate is it?About 90%. 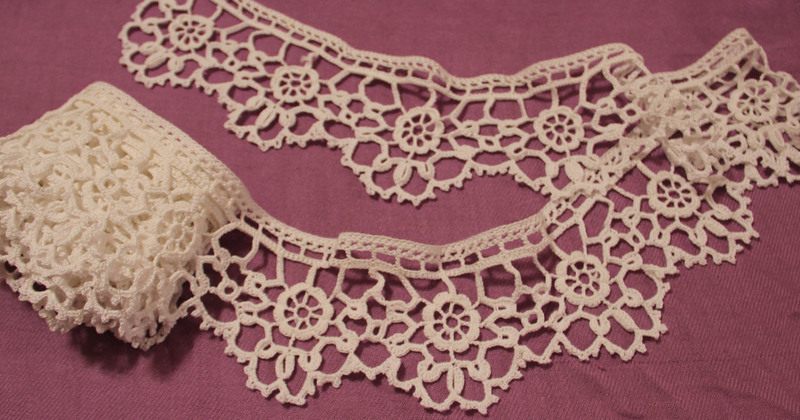 It’s impossible to get completely accurate materials — for example, the quality and size of the cotton are a little off, and I have a feeling the thread I used for the crocheted edging is the wrong size (it was the right number, but seems a little on the large side). Otherwise, it’s completely hand-sewn with period plain-sewing stitches. First worn: Not for a while yet — I need to finish the cage and/or crinoline, not to mention a whole bunch of other pieces to complete my 1850s wardrobe. This petticoat, along with others, will eventually be part of a mixed-media art exhibit as well. 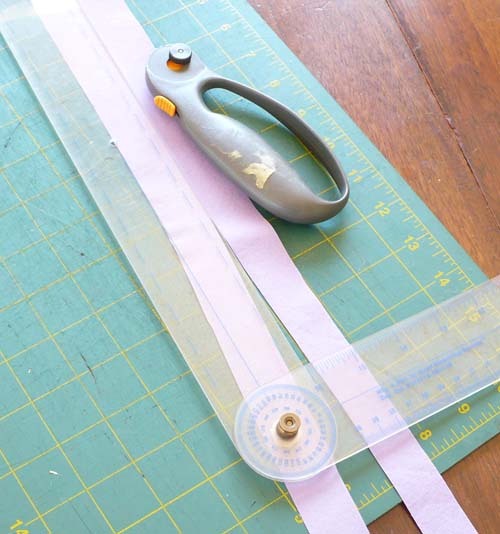 Total cost: Counting fabric and crochet thread, about $15. 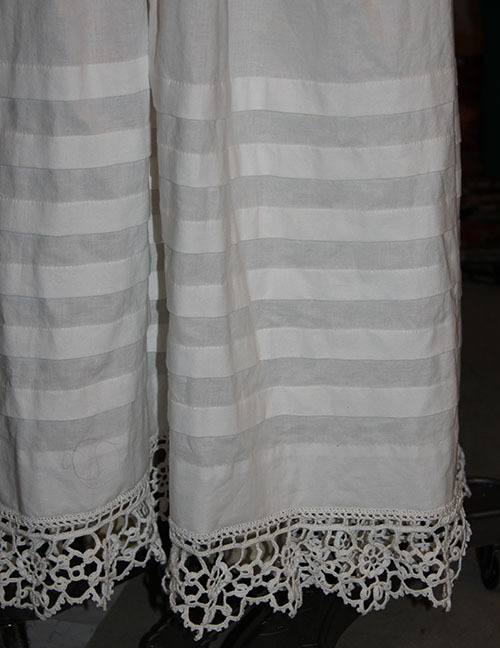 My guipure petticoat trim is complete! It measures just a bit longer than 150 inches — perfect to apply to one of my three breadth (of 45 inch muslin) petticoats. Actually, I’m now even closer to finishing my latest petticoat edging than when I took this picture…thanks to an evening at home watching movies with my favorite fellow. I’m working on the final row. It’s going fairly fast — I’m nearly halfway done after just a few hours of work. 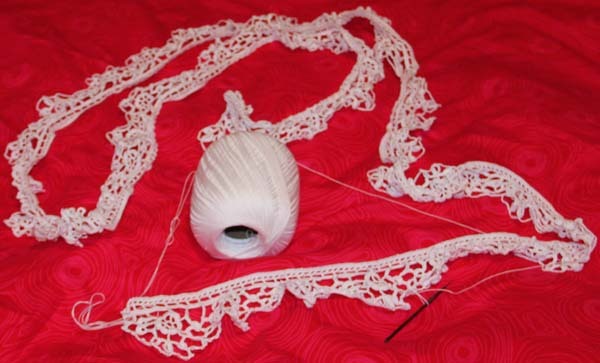 Good thing too, as I’m getting a little tired of crochet — at least this pattern. And my wrists ache, my fingers are stiff, and there is a nasty bruise on my right palm where the end of the hook rests. Genius is pain. Next I’ll need a petticoat to sew this to. I think I have just enough muslin left. 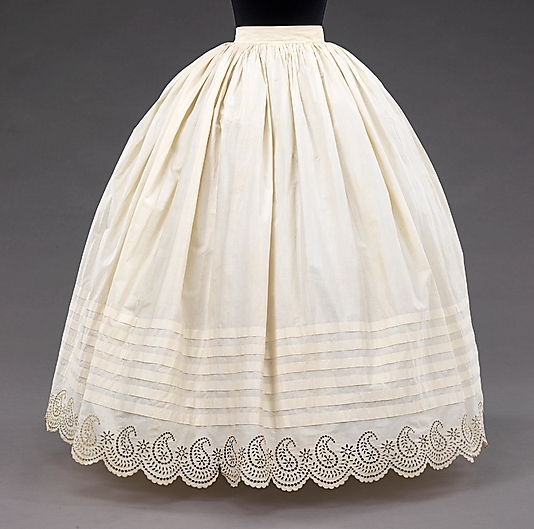 Tucks seem like the way to go again, since I still have yet to find any evidence of a mid-19th century petticoat sporting both crochet and embroidery.